This page highlights Artstor content related to the study of the history and culture of the Middle East, from Morocco and North Africa to Turkey and Iran, including photographs of important sites, people, and historical events, as well as images of calligraphy, ceramics, textiles, glass, and metalwork. Image source: Abu'l Qasim Firdausi. 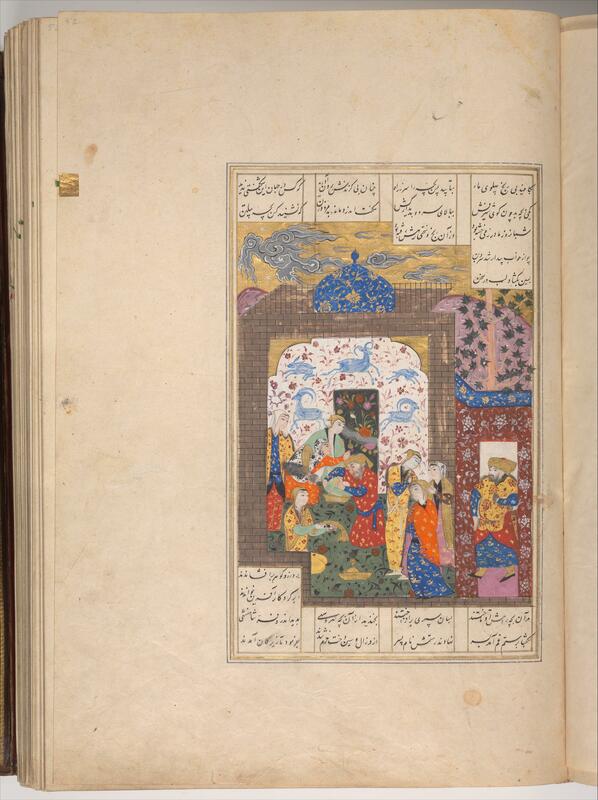 Shahnama (Book of Kings). 1475-1675. The Metropolitan Museum of Art. Browse by geography to find images of specific countries in the Middle East (e.g. Israel, Jordan, Lebanon). Browse museums with encyclopedic collections (e.g. The Metropolitan Museum of Art or the Museum of Fine Arts, Boston) by classification and then by country name. Keyword search terms such as mosque, Ottoman, Persian, Seljuk, and others will retrieve over 1,000 images — use these general terms in combination with others to narrow your results. Try these sample search terms to find images related to Middle Eastern studies. Don't forget to use the search filters to narrow your results. Magnum Photos has shared approximately 115,000 iconic photographs, including images documenting 20th century historical events and contemporary life in the Middle East. Photojournalist Robert Capa covered seminal events, such as the establishment of Israel as an independent state in 1948 and the ensuing Arab-Israeli war. Magnum photographers have chronicled political upheavals and their enduring effects on the people and built environment of the region, such as the Lebanese Civil War (1975–1990), the Iranian Revolution (1979), and the Iran-Iraq War (1980–1988). The role of the United States military in the area is recorded with documentation of the First Gulf War (1990–1991) and the Iraq War (2003–2011). The Magnum collection also includes images of contemporary life, religion, and culture throughout the region, whether photographs of the Hajj pilgrimage to Mecca, Saudi Arabia or everyday life in the streets of Cairo, Egypt.